Using Custom Glasses With Custom Beer! Many people enjoy doing many different hobbies. One great hobby is brewing your own beer. When brewing your own beer you can choose the flavor and alcohol content you want in your personalized beer. You will need certain equipment to brew your own beer, but if it is your hobby then it is worth it! After the start-up costs, making your own beer at home can be cheaper than purchasing it on a daily basis. Everybody enjoys having a nice cold beer every once in a while, this will save you the hassle of having to leave your house to get it. Your house would be the ultimate hangout when it came to having others over for a couple beers! When brewing your own beer, how cool would it be to have your own custom beer glasses to put it in? You can add the name of your beer on the glasses its self. You can purchase bar glasses or even cheap pint glasses with your logo. Many people would find this really neat. After all it is a hobby; you should put your own fun customization into it. If you are one of the many individuals who enjoy brewing your own beer then keep in mind this neat personalized bar glass idea. If you have not yet tried brewing your own beer, then you should also give it a whirl. So next time you are trying to decide on a new hobby, make sure to keep this fun hobby in mind! Winter and the holiday season see a lot of really good, small production seasonal brews in the form of Christmas beers and winter warmers. Christmas beers are often malty and complex although there are no rules for how they should be brewed. Some are made with fruit or spice and some rely on artful malt or hops combination for wonderful complexity. The winter warmers are similar though they are rarely made with any adjuncts. Both typically contain more than usual alcohol and are usually available from November to February. And so, in no particular order, here are my Christmas and winter beer selections. The king of Christmas beers, Samichlaus is the highlight of the holiday season for many beer enthusiasts. It is a rich, aged doppelbock brewed at the Austrian brewery Schloss Eggenberg. This mix pack contains a variety of beers. This makes it a nice way to try some unusual beer for beer lovers who are just discovering craft beer. Though it can change from year to year the mix pack often contains Boston Lager, Old Fezziwig Ale, Winter Lager, Holiday Porter, Black Lager, and Cranberry Lambic. How do you say Merry Christmas to a hop-head? With a six pack of Celebration Ale from Sierra Nevada. Besides have a pretty significant bitterness at 62 IBUs, this beer is also dry hopped which raises the hops in the aroma and flavor. Samuel Smith’s Winter Welcome is a traditional winter warmer and in many ways has served as the modern benchmark for the style. It is big in flavor and alcohol. Though maltiness dominates it does have a good bit of balancing hops as well as hints of apples and caramel. Odell Brewing brews Isolation Ale as their winter seasonal. This beer is packed with hops character without a lot of the bitterness. It’s a bit unusual as a wintertime beer in that it does not carry the huge, dark malt flavors of many of the others. If you enjoy or brew your own beer chances are you may have some stray empties lying around the house, and while they can fetch a pretty penny down at the recycling plant empty beer bottles can also hold other useful purposes. The same thing goes for old wine bottles. For instance, if you clean the bottle’s inside, fill it with a bit of water, and place a single flower inside you can give your sweetheart a fairly simple, yet charmingly unique wedding or birthday gift. Another romantic gift idea is the wine bottle candle. You simply wash the bottle well and place a long, narrow candle in the neck of the bottle until it is snug. Wine bottle candles can help add a romantic atmosphere to any ordinary dinner table. Empties can also be easily turned into Christmas decorations. Just look at the example below! If you’re looking for a more artistic use for your empties, you could always try assembling broken bottle glass into a mosaic, or you could also set them up for a still-life painting. 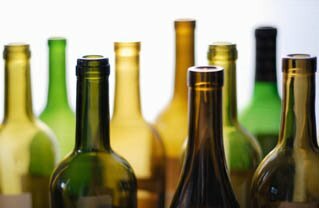 Most importantly, if you are a home brewer or wine maker you can reuse your commercially purchased wine bottles and save a considerable amount of money. Don’t forget to re-label your recycled wine and beer bottles with your own, customized beer and wine labels.